For a while, it looked like this recipe wasn't going to happen. One week, we ran out of time to shoot it, the next our local seafood store was out of lobster, the week after that Amanda and I were both going to be away and couldn't do a shoot. It was beginning to seem like one of my all-time favorite dishes -- which I've sampled all up and down the Northeast coast, from Esca in New York to Street and Company in Portland, Maine -- simply wasn't meant to be. At least not this summer on Food52. But then at the end of August, I spent a week with my family in Maine, and the opportunity presented itself: a fisherman friend offered to drop off a bunch of lobsters, and I knew exactly what was going to be on the menu. If it's done right, Lobster Diavolo sings with the fresh, juicy tang of summer tomatoes and thrums with the gentle heat of chilis. When tossed with al dente pasta, the sauce provides a kicky backdrop that complements rather than overwhelms the sweet suppleness of the lobster itself. I like to keep the lobster in large pieces so it looks pretty on the plate, and I've always loved Esca's addition of fresh mint, so I adopted it myself. Last week, we were finally able to shoot this dish. We snuck in the photo at the very end of the day, as the light was waning. Once we had the shot, and we were all gathered around the pan, forking up spicy strands of pasta and sweet chunks of lobster, I felt that somehow, summer was now complete. Photos by Nicole Franzen and Joseph Di Leo. I would like to try this recipe as it looks so delicious. In Florida, I have a wonderful shop that carries fresh Maine lobsters twice a week. Is there anything I can substitue to get good results without using garlic? I cannot use garlic in anything. Thanks! Why not just soften some onion or shallot with the chili flakes? That should work nicely. I want to twist my fork straight into the photo on the screen. Absolutely my favorite dish!!!!!! Havent had it about in 10years my favorite eatery in Brooklyn NY closed. I always ordered twice one to take home to eat later, boy am I greedy, Thank you for bringing such joy considering now that we moved to Florida. Just looking at the picture makes my stomach smile.Wow I'm happy!!!!!!!!!! What restaurant was that? And you're very welcome! Thanks! And the lovely Nicole Franzen took the photo. It's a beautiful photo and does justice to a wonderful-sounding dish!! This looks wonderful and you make it look so doable. I am going to try to make this while the tomatoes are still fresh. It's really not a lot of work -- just requires a little planning. This is so perfect...I just returned to Napa after 2weeks on the East Coast, including NY, Nantucket and Boston. I'm ready for more lobster! We're hoping(an understatement) for our Indian Summer to get the grapes ripened, develop flavors and finally picked. I want this. Now. Immediately. Fantastic! This is one of my favorite dishes -- a must cook and eat as I hold on to the last days of summer. Thanks, Merrill! We're all holding on, I think! I love this. It's also delicious made with shrimp. 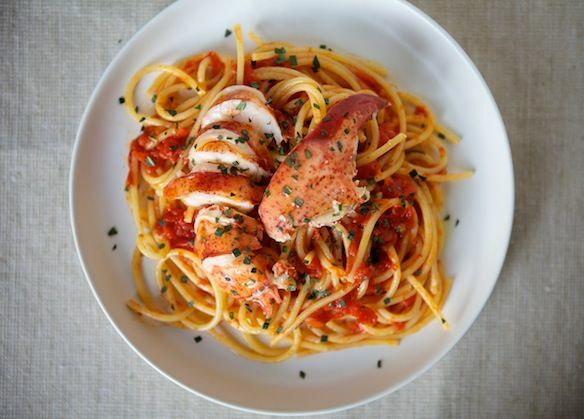 When I lived in the North End of Boston, we used to go over to Daily Catch, a teensy storefront on Hanover Street, where Lobster Fra Diavolo was the specialty. It was best in the fall and winter, because they cooked right there in the seating area and there was no ac, so the place was not only tiny, but also very warm. Thanks, ChefJune! And probably much simpler to make this with shrimp. I used to live in the North End, too! Love the Daily Catch.... This was the only dish I would order there. I'll have to make this VERY soon! I have the same memories, ChefJune! Once I was there on my birthday. The only other party there was room for in that tiny space was also celebrating a birthday, and it was a great Lobster Fra Diavolo extravaganza. What a stunning dish. Glad the stars aligned for you to make it!